At our famous Coggeshall branch our enthusiastic advisors have a wealth of furnishing experience between them. They are happy to come and visit you in your home to measure and advise on colour and design and discuss the many different window treatments available. We also offer a restoration and re-upholstery service. We have a delightful collection of fabrics on show in our store. Our vast selection from fabric houses includes luxurious silks, florals and contemporary fabrics. 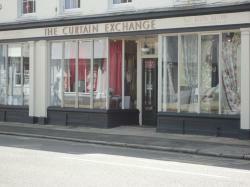 Curtains can be taken out on 24 hour approval. Many of our customers return to visit us time and time again, which is a reflection on how confident we feel about the service we provide.